Hi everyone, we thought that we would use this posting as a good opportunity to tell you all about all of the changes that we make here at Dinosaur Safari Adventure Golf and why we make these changes. The simple answer is we make these changes because we care and we want all of you to have the absolute best experience possible when you come to see us. Last year we made lots of changes to our 18 hole course here at Dinosaur Safari Adventure Golf, the biggest change we made was to relay all of our greens, we did this so that everyone that came would be playing on an absolutely fantastic putting surface that so that the competition would be closer than ever despite different abilities. The new greens also look brilliant and really help make Dinosaur Safari Adventure Golf look vibrant and new. We also added a big dinosaur head to the entrance to the course that you have to walk through before making it to the 1st hole. Be careful not to misbehave otherwise the head might just bite down and eat you! 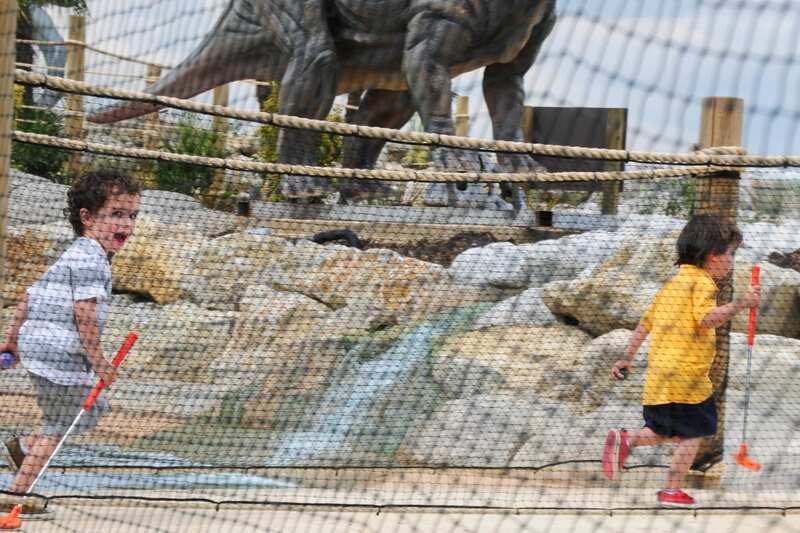 Another addition to the course at Dinosaur Safari Adventure Golf was to bring in our Pterodactyl, believe me this was not easy, you know Dinosaurs became extinct about 65 million years ago right?! Here at Dinosaur Safari Adventure Golf we have decided to change our Slush to our new supplier, Polar Krush which you’ll notice when you next visit us. The reason for this change is because Polar Krush specializes in ensuring that all of their slush produce is all 100% natural and sugar free. We believe that this is really important and we are really proud to be able to offer their products at Dinosaur Safari Adventure Golf. Polar Krush also have lots of great flavours ranging from Strawberry Drift to Chilly Cherry and lots in between. For now we have gone with Strawberry Drift, Blueberry & Raspberry, Lime chiller & chilly Cherry. However there are lots of other flavours that we can get, if there is any flavour that you would like to see let us know, if you have a craving for Berry blast or Orange Freeze or even Bubblegum burst let one of our team members know, we are always open to change! Another change that we made here at Dinosaur Safari Adventure Golf was to introduce the role of Visitor Experience Hosts. Our hosts will be ensuring that you are enjoying your round of adventure golf while you’re on the course. If you need a new ball or if you’d like a family photo taken, our hosts will happily give you a hand. When you see our hosts around the course why not challenge them to your favourite hole and see if they have the putting ability to get a lower score than you, if you win you might even get a prize! If you would like to read more about our Visitor Experience Hosts and read some more about them please see our previous blog postings below. All of us here at Dinosaur Safari Adventure Golf are really looking forward to seeing you soon, whether you are coming for a family day out, a birthday party, a date or even just with a group of friends. We all want to ensure that you have the best visit possible and will do everything in our power to ensure that is the end result. To keep up to date with all of our latest offers why not follow us on Facebook & Instagram. Search Dinosaur Safari on Instagram to find us, hope to see you all soon! I confirm that I am happy for Adventure Experience to contact me to promote new services and promotional activities. Company No. 07162576 Copyright 2018 Adventure Experience Ltd.